Photo by Hugh E. Gentry. ©2015 Disney. All Rights Reserved. That’s what I told my antsy 4-year-old daughter towards the end of Monday’s “Moana” press conference at the Disney Aulani. That’s right, I took a 4-year-old to a press conference. Can you blame me? After all, press conferences for Polynesian Disney films featuring Mililani girls don’t exactly grow on trees. So risking embarrassment, judgment and an unlikely-but-possible meltdown, I brought my “Let it Go”-loving toddler into a ballroom full of reporters. Photo by Hugh E. Gentry. ©2015 Disney. Well, she loved it. 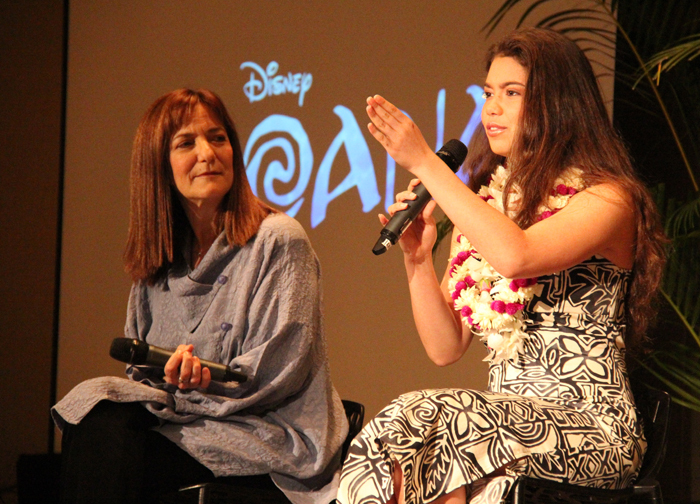 The “Moana” presentation featured producer Osnat Shurer, directors John Musker and Ron Clements, and Moana herself, Auli‘i Cravalho. My daughter got to see some beautiful test footage and clips that only a handful of people on the planet were lucky enough to watch. 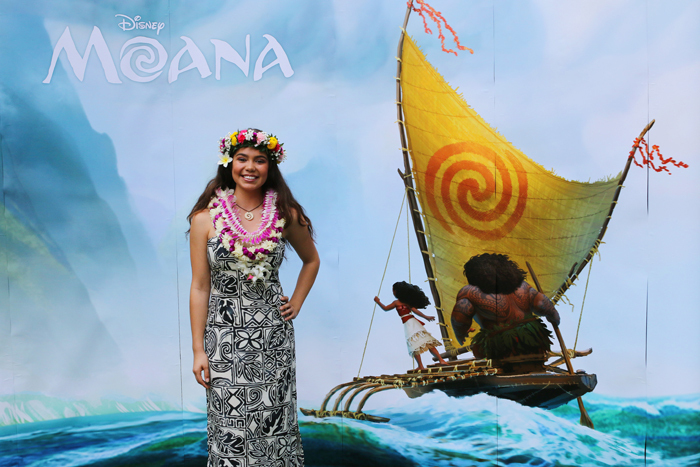 Here are 10 things we learned about the upcoming Disney film that has all of Hawaii talking. 1. 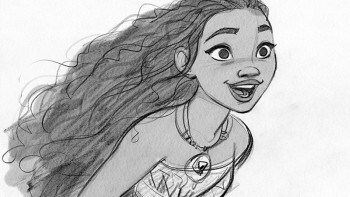 “Moana” isn’t a story about Hawaii. While the casting of Cravalho (a Kamehameha Schools-Kapalama sophomore who was plucked from obscurity for the lead role) makes it seem like this is a Hawaiian story, “Moana” is actually centered in the South Pacific. 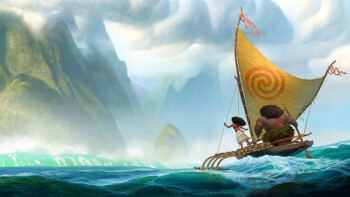 Set 2,000 years ago around the islands of Samoa, Fiji and Tonga, it’s a tale about the rebirth of Polynesian voyaging. So “Lilo and Stitch” have nothing to worry about. 2. The directors created THREE prior Disney princesses. 3. This is a Maui origin story. 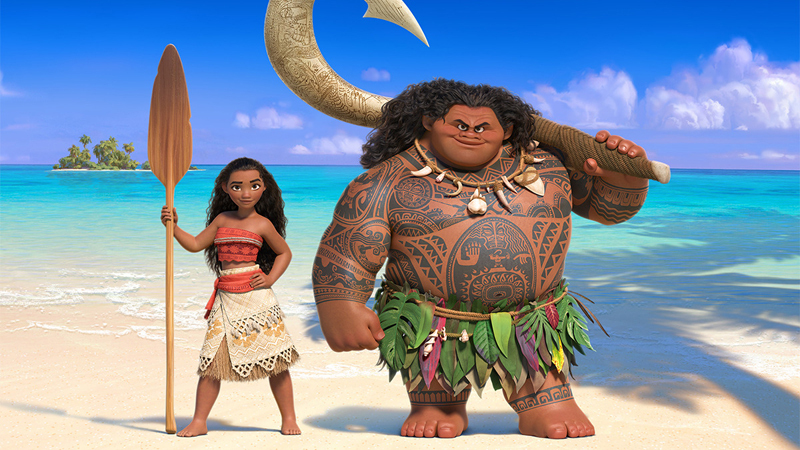 Speaking of demi-gods, “Moana” also features Maui, voiced by Dwayne “The Rock” Johnson (McKinley High School represent). But this isn’t the Maui who roped the sun above Haleakala. This is the Maui of the South Pacific, who was already a legend, long before arriving in Hawaii. The test footage showing Maui’s tattoos coming to life got a giggle from my daughter. 4. “Moana” is a musical. 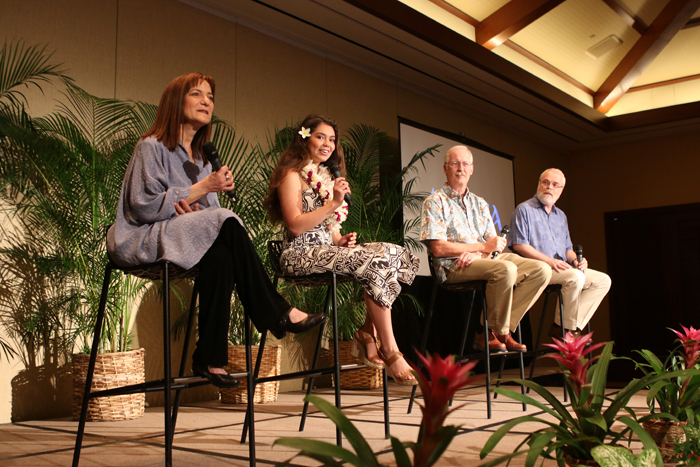 The creative team played a performance of “We Know the Way,” an original song for “Moana” performed by Opetai Foa‘i of the Samoan band Te Vaka. It was beautiful, rousing and emotional in that very unique, Disney way. And I don’t even speak Samoan. 5. This teenage princess is voiced by a teenager. 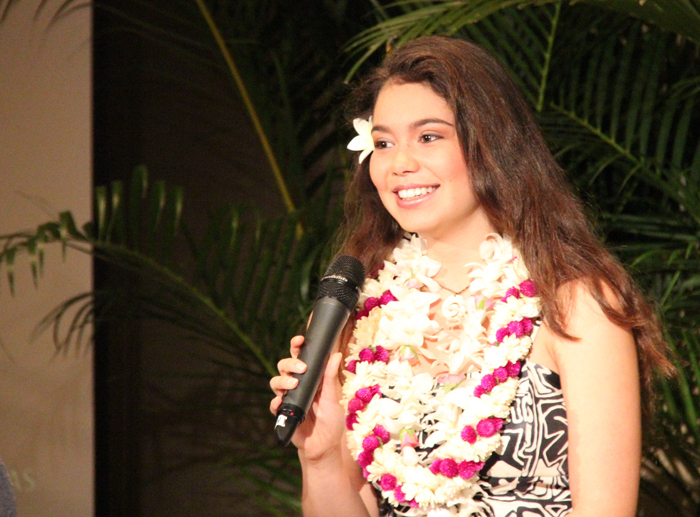 Much has been written about Auli‘i Cravalho, the Hawaiian-Portuguese-Chinese-Irish 14-year-old who was casting director Rachel Sutton’s very last audition. But all I could think about while listening to her onstage was how much of a disaster I was at 14. I was pimply, awkward and my fashion sense was tragic. On the other hand, Cravalho seemed poised, confident and magnetic. 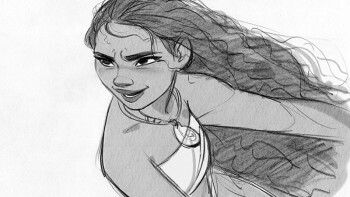 It’s easy to see why Disney chose her instead of an older actor (Anna/Kristen Bell, 33; Rapunzel/Mandy Moore, 28) to embody the fearlessness and passion of Moana. Mulan. She loved how the character brought honor to her family. This was met with some ribbing from directors Clements and Musker, who did not create Mulan. The footage of Pua, Moana’s baby pig, and Hei Hei the rascally rooster made my daughter light up like a Christmas tree. 8. The ocean is a character. “The ocean doesn’t divide us. It connects us.” That sentiment inspired Clements and Musker to make the ocean a major character in the story. The best footage they shared was a scene where the ocean literally came to life to play with baby Moana. Words don’t do the sequence justice. All I can say is that for those few minutes, everyone in that room was 4 years old again. 9. This is a story we could’ve told. Throughout the presentation, the creative team stressed their commitment to authenticity and their respect for the cultures they were representing. But who knows more about local culture than the locals themselves? For all you local filmmakers, “Moana” shows that there’s an audience for our stories and the time to tell them is now. I mean, why should Disney have all the fun? 10. Hurry up and wait. “Moana” premieres on Nov. 23, 2016, more than a year from now. My daughter will be 6 years old. So while this weekend was full of buzz, “Moana” is still at the beginning of its journey. At the very least, it’s off to a fantastic start.